At the present time, we have 12 mission ready K9 teams and 4 teams in training. As such, we are not able to add additional resources to our roster without compromising the quality of our existing teams. If, after reading all of the information below, you still believe that you are a great candidate, please contact us for consideration. 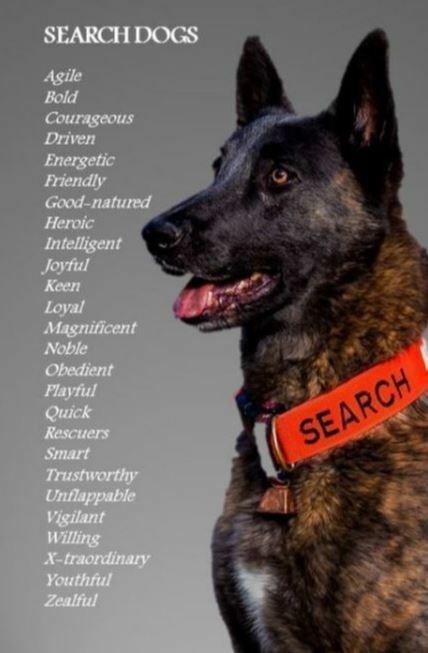 What is Great Basin K9 SAR? GBK9SAR welcomes new handlers who bring commitment, relevant skills, and physical capability. Currently, our handlers all have prior SAR/Ski Patrol, Military, Law Enforcement, and/or working dog experience. Our search dogs are carefully selected for temperament, physical aptitude, and balanced working drives. K9 SAR requires thousands of hours of training, thousands of miles of driving, and a substantial financial investment for uniforms and field equipment to become a certified and deployable mission ready team. It is important to understand that even after certification, maintenance training continues through the lifetime of the dog. Although we are all passionate about K9 SAR and enjoy working with and training our dogs, K9 SAR is neither a hobby nor a sport. K9 SAR provides a service which is sometimes a life and death mission, requiring commitment and professionalism by both handlers and dogs. Never convicted of any felony, or misdemeanor involving violence or substance abuse. Pass a physical, or certification of good physical condition for performing strenuous physical activity as found in Search and Rescue work, from a qualified private physician. Not suffering from any mental illness that would impair normal reason and judgment. GBK9SAR requires that prospective handlers attend their first training without a dog. This allows you to meet the group, learn what K9 SAR is about, learn the different working tasks of the dogs (Air Scent, Trailing, Cadaver, Water, obedience/agility requirements, different types of indications), and determine if K9 SAR is for you. You will have an opportunity to work with one or more of our handlers and participate in training exercises. You will need to bring enough food and water, clothing, and the proper gear for the terrain and weather conditions as GBK9SAR trains in all types of weather and in remote areas without facilities. The next step is to evaluate your dog for working drive. All dogs must be current in vaccinations before participating in any training. We also require a $60 nonrefundable application processing fee prior to working with you and your dog. The GBK9SAR Information and Application Package can be downloaded from the link below. During the initial trainings, we will evaluate and work with you and your dog, give you direction for yours and your dog’s training, and guide you and your dog to capitalize on your dog’s natural abilities. GBK9SAR handlers will give honest and objective feedback about your dog’s progress and suitability for SAR work. We cannot, however, guarantee that your dog will be successful in achieving certified/mission ready status. You will need to bring the following equipment for your dog: your dog’s favorite treats and toys, leash, harness, long line, flat collar, and water. You must be able to secure your dog safely in a crate and/or your vehicle. Dogs cannot be tied out or left loose. They must have adequate ventilation and/or shade when secured in your vehicle. Reflective tarps, space blankets, mesh products all help to keep vehicles cool during warm months. All dogs must remain leashed or secured unless working a training problem. A word of caution: as the dogs mature and learn “the search game” their excitement, enthusiasm, and frustration when not training increases. This sometimes results in damage to vehicles, seatbelts, windows, etc. when the dogs are not properly contained. What kind of dog should I train for SAR? Can I start training with a puppy or is an older dog preferred? Training of a successful search dog can start as early as 7 weeks old. Older dogs can also be trained for SAR work, however, GBK9SAR prefers to start dogs by the age of 4 to allow for a longer working life. If you don’t have a suitable dog, we recommend you attend several trainings to see what breed and working style dog you prefer. GBK9SAR handlers can assist in selection and give recommendations re working line dogs/litters with proven success in SAR. How long before I can go on searches with my dog? Training a dog and handler team to full mission ready/certified status can take 1 ½ to 2 years training, attending training at least once per week with a minimum of 16 hours per month. However, once you have completed your field handler skills, you may be able to go on searches without your dog in support of other K9 teams to gain field experience. What handler skills are required? GBK9SAR requires K9 handlers to be current in CPR and have medical first responder skills such as American Red Cross Emergency Response card, EMT, etc. K9 handlers must be proficient in the use of GPS, map and compass, radio communications, wilderness survival skills, man-tracking awareness, lost person behavior, crime scene awareness, K9 First Aid, understanding of scent theory, weather behavior, and SAR theory. Physical capability to negotiate rugged terrain is also required of both handlers and dogs. GBK9SAR handlers meet weekly for group training. Additional informal trainings are coordinated as handler’s schedules allow. Additional training takes place on an individual basis to work on obedience, agility, direction and control skills. GBK9SAR is a proud member of Tri-State K9 SAR, an association of search dog teams from across the Intermountain West (Utah, Wyoming, Idaho, and Montana). Tri-State has established a rigorous set of certification standards and all member groups have agreed not to field any dog teams that have not met these standards. To see these standards, click here and then click on "Standards". OK, I'm Ready! What do I do Now? If, after reading all of the above, you still think this sounds like something you want to do and believe you are a great candidate, then please send an e-mail to GreatBasinK9SAR@gmail.com for information and consideration.